Breaking ground on the new biomass heating plant to be built on the University of Maine at Farmington campus are, from left to right: MF Chip Gavin, UMaine System director of Facilities Management and General Services; UMaine trustee Karl Turner; UMF biology professor Drew Barton; Laurie Gardner, UMF executive director for finance and administration; Kathryn Foster, UMF president; Gerald Cayer, who serves on the UMF Board of Visitors. 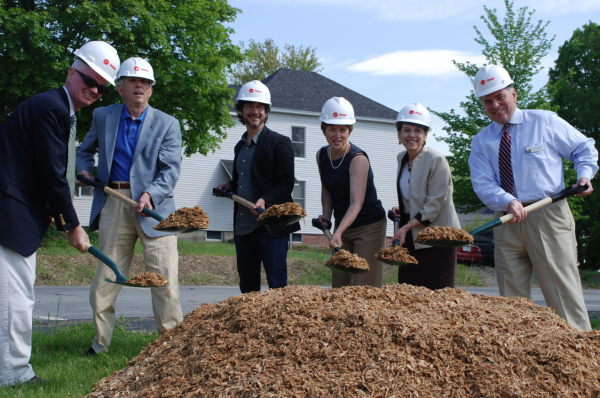 FARMINGTON - With construction set to begin on the University of Maine at Farmington's new $11 million biomass heating plant, a groundbreaking ceremony was held Tuesday morning. The plant is expected each year to result in UMF using 400,000 fewer gallons of oil and saving $900,000. The plant "will benefit UMF and the region environmentally, economically and educationally," said Kathryn A. Foster, UMF president. The biomass heat plant is to be constructed in the university's current parking lot at the corner of Quebec and Perkins Street. The 5,800-square-foot boiler plant was approved by the UMaine System Board of Trustees in January. The project consists of a building to house a combined control room/viewing area, which could be accessed by students in class, along with wood chip storage bins and a boiler that would heat water for distribution to 24 UMF buildings on campus through a loop system of pipes. An electrostatic precipitation device will filter the plant's exhaust to below the Environmental Protection Agency-mandated .025 part-per-million limit. Exhaust from the chimney will typically be clear or include a small amount of steam. Buildings connected to the loop would have their preexisting heating systems either replaced or modified, depending on age. Some of the newer systems would be maintained to provide some additional heating input into the system. The $11 million project is expected to have a 10-year payback for UMF, reducing the campus' fossil fuel consumption by 90 percent. The Farmington Planning Board unanimously approved the project's permits at their April 13 meeting. Earlier, some planers and residents living near the proposed site of the project expressed concerns that included increased tractor trailer traffic which will deliver the wood chips, the building's design and potential noise at the plant. Through successive meetings, engineers working on the project allayed many of the concerns and revised the design to move the 50-foot-high, 32-inch diameter chimney closer to the building and plan on enclosing it as an addition to the building. In her remarks on Tuesday, Foster noted those who participated in the process towards approval. "The input was important and for that, the project is better," she said. Drew Barton, a UMF biology professor and member of the campus energy management team who worked on the project, said in general all energy sources have a negative impact on the environment and UMF is no different. Many worked to come up with a feasible solution that would lessen the environmental impact to provide heat to the numerous buildings on campus. "I'm proud of the students, faculty and community members who worked to solve how best to heat this campus," he said. "This biomass plant is a giant stride forward and be better for the planet." He said currently, UMF uses 86 percent oil, 8 percent propane and 6 percent geothermal to heat its buildings. Once the plant is built, 3 percent oil, 10 percent propane, 8 percent geothermal and 79 percent wood will be used. "That's an amazing transformation," Barton said. UMaine trustee, Karl Turner said "today, we see the university's philosophies come to life." Attending were UMF faculty and staff members, members of the Board of Visitors, UMaine System officials, project design engineers and town officials. A computer-generated rendition of UMF's heat plant to be built this summer. This will look way better than most of the crummy buildings the Farmington Village Corporation is trying to "protect." Is this just a biomass heat plant or heat/power generation plant? It's specifically a heat plant. How is that geothermal working out the college put in a couple of years ago? 86% oil down to 3% that does sound great!! I also have a question.. is UMF still looking to add natural gas? After an incorrect installation, and the working out of the usual "bugs" that any new system has , the geothermal has been as advertised. Warm in the winter, cool in the summer. Very nice indeed. My question: What if Bill Marceau or Buzz Davis wanted to do this? Would it be as well received? Or what if I decided to build one in MY back yard? Would I get anything but negative press? NO! My suggestion is that now UMF is saving so much money in heating their campus, how about passing some of those savings on to the local tax payers? UMF pays nothing. But if they're saving all this money in the big picture, and it's Farmington's air that will be challenged, don't you think it would be in everyone's best interest to pay some taxes??? How about pollution assessment? One more building the town can't tax. Tom: And what are the crummy buildings we're trying to protect? Nancy: You're on the Village Corp? No, Tom I'm not. And they don't pay taxes either. Tax the churches and then we can talk about taxing PUBLIC NON - PROFIT educational institutions.